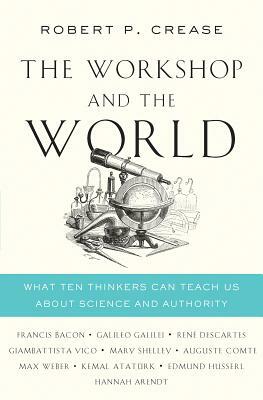 Join us at Book Culture on 112th on Tuesday, April 23rd at 7pm as we welcome Robert P. Crease, in conversation with Massimo Pigliucci, to discuss his new book, The Workshop and the World: What Ten Thinkers Can Teach Us about Science and Authority. When does a scientific discovery become accepted fact? Why have scientific facts become easy to deny? And what can we do about it? In The Workshop and the World, philosopher and science historian Robert P. Crease answers these questions by describing the origins of our scientific infrastructure--the "workshop"--and the role of ten of the world's greatest thinkers in shaping it. At a time when the Catholic Church assumed total authority, Francis Bacon, Galileo Galilei, and Ren Descartes were the first to articulate the worldly authority of science, while writers such as Mary Shelley and Auguste Comte told cautionary tales of divorcing science from the humanities. The provocative leaders and thinkers Kemal Atat rk and Hannah Arendt addressed the relationship between the scientific community and the public in in times of deep distrust. As today's politicians and government officials increasingly accuse scientists of dishonesty, conspiracy, and even hoaxes, engaged citizens can't help but wonder how we got to this level of distrust and how we can emerge from it. This book tells dramatic stories of individuals who confronted fierce opposition--and sometimes risked their lives--in describing the proper authority of science, and it examines how ignorance and misuse of science constitute the preeminent threat to human life and culture. An essential, timely exploration of what it means to practice science for the common good as well as the danger of political action divorced from science, The Workshop and the World helps us understand both the origins of our current moment of great anti-science rhetoric and what we can do to help keep the modern world from falling apart. Robert P. Crease is a professor in the Department of Philosophy at Stony Brook University, New York, and former chairman of the department. He has written, translated, or edited over a dozen books on history and philosophy of science. Crease is Co-Editor-in-Chief of Physics in Perspective, and writes a monthly column, “Critical Point,” for Physics World magazine, on the philosophy and history of science. His articles and reviews have appeared in the Atlantic Monthly, New York Times, Wall Street Journal, Newsday and elsewhere. Massimo Pigliucci is the K. D. Irani Professor of Philosophy at the City College of New York. He is the author of many books, including, most recently, How to Be a Stoic: Using Ancient Philosophy to Live a Modern Life.